When playing any musical instrument, you need to learn how to play the notes. If you want to play any instrument, you have to have one and this is especially true if you want to play a guitar. The notes are played on the guitar’s fret board. Learn to play guitar notes now and you too can conquer the guitar’s fret board. You don’t have to be scared of the fret board. Even if it seems that it’s hard to learn the notes, if you really want to learn how to play the guitar, this should not discourage you. Playing the very first songs on your guitar will be easier if you know the notes on the first guitar string. On this string, there are three notes – E, F (first fret), and G (third fret). The second string is B, C (first fret), and D (third fret). Now that you know the notes, you have to conduct some exercises. Slowly play these notes and make sure that you concentrate to learn notes well. You don’t have to say all the notes out loud when you’re practicing. You can do this inside your mind and then slowly play them. You must know the notes as well as their names, and most especially their sounds. Know them by heart. You can start by playing simply melodies like that of nursery rhymes. After mastering the notes on the first two strings, you have to proceed on the third string. G is the open string and the other note is A (second fret). When you know these notes already, start playing them together with the other notes you’ve learned previously. Again, you must stick with simple songs. You don’t have to work on all the notes at once. Try to master each of the notes and learn them consciously. 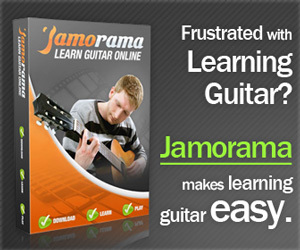 Even small children can learn guitar notes easily. Follow these steps and in no time, you can play the notes on the guitar. Learning to play guitar notes will be very hard if you don’t have your own guitar. You can’t depend entirely on the music sheets that you have. You have to hear the notes being played on the guitar’s fret board. Many beginners fail to learn because they don’t have guitars on their hands. Once you learn the notes, you can now read advanced music guitar sheets. Everyone knows nursery rhymes and even if you’re all grown up, you still know these songs. It will be a lot easier to learn the notes by using these simple songs. Once you master and memorize the notes, you can now play the songs that you like. Guitar notes are not really hard to learn as long as you know what to do. You don’t need an expert teacher in order to learn these things. You can teach yourself these note lessons by using DVD programs or internet guitar programs. You can also use an instruction book. Still, if you can afford the expensive guitar teachers, you can always hire them. But let this serve as a reminder, no matter how good your teacher is, if you don’t have the right attitude in learning, you will not learn anything. You see, guitar playing is like the lessons that you learn in school. You must know the notes by heart, you have to be motivated and you must be persistent.